• War 3 Model Editor: Program for converting MS3D ito MDX. The importance of community feedback and advice. Sometimes less is more, several units, upgrades and ideas were cut during the project. Balancing gameplay with gradually expanding tech-tree, strategic options and difficulty. Creating models that are easy to distinguish from each-other in-game. Panting textures in Photoshop by following tutorials, using reference pictures and looking at other games. Creating new maps required a lot of testing to achieve enough space to play on in terms of defense, base expanding and moving units. 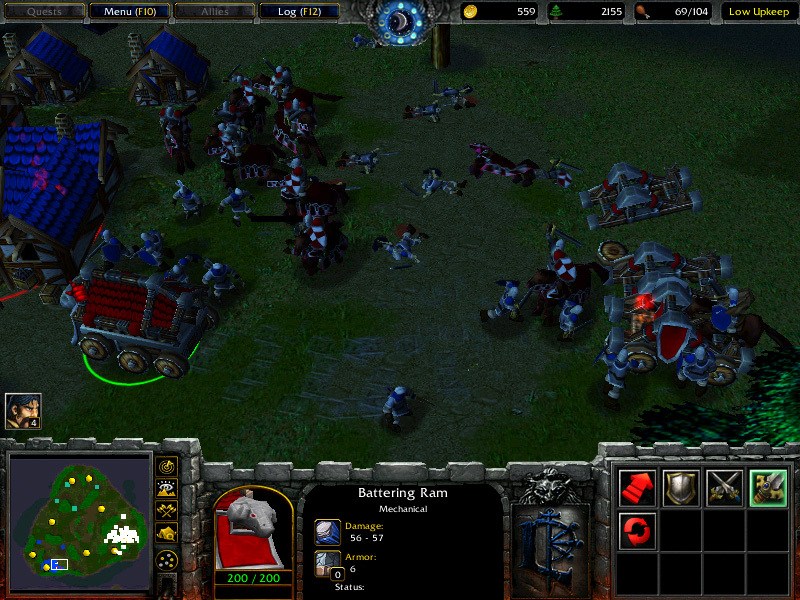 Warcraft 3 has always been a game close to my heart. I have played Warcraft 3 for 14 years, made custom maps, models, mods, reskins and projects and even though Warcraft 3 date back to 2002, making a complete mod in it has always been in the back of my mind. When I started the project I already had ideas, unit and map sketches scribbled down on notes and books and documents on balance ideas and genres. Digging all of this up gave me something to start to work with. The rest was already in the Games Map Editor. The first ideas were along the lines of Age of Mythology with different civilizations and the option to, for each age upgrade, choose a god with unique technology upgrades, units and a “god power” that could wary from meteor showers to a healing spring.During the planning stage, looking at renowned Age of Empires 2 streamers, reading tactics from RTS gamers and testing I realized that in this case, less is more would work better. I later decided to start easy and use Age of Empires 2 as a base with only one civilization and no unique upgrades or units. I changed the attack and armor types in the game to Pierce Damage, Hack Damage and Siege Damage and Heavy Armor, Leather Armor and Siege Armor. Each type of attack was balanced to be especially efficient towards different armors. Among the buildings in favor there is one building that stands out, the Garrison. The garrison is a building without any type of attack and is a mainly for researching expensive upgrades. The upgrades usually improve a diversity of units or buildings rather than just a single unit type. 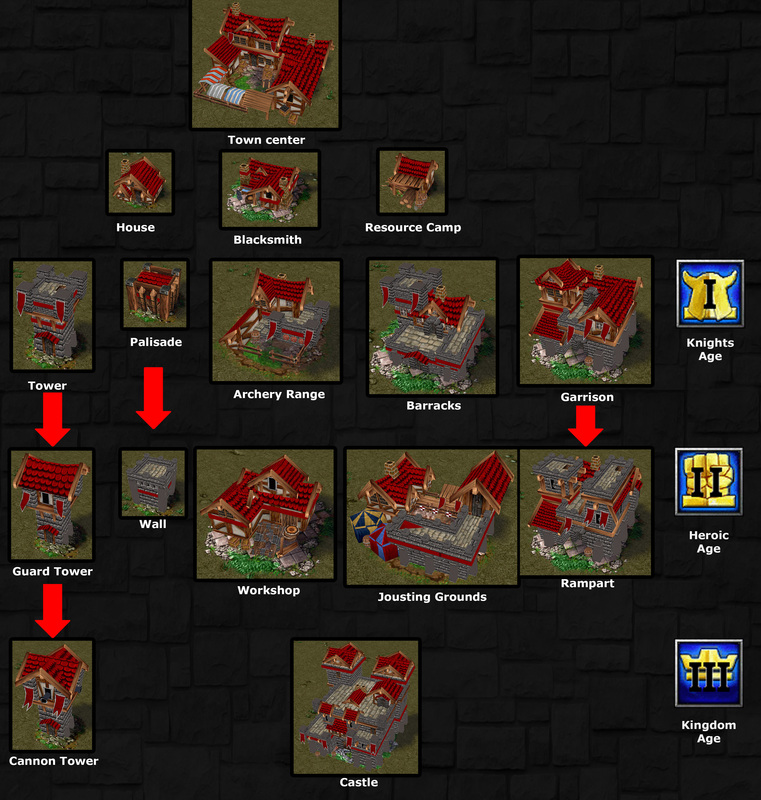 In the third age, the building can be upgraded into a Rampart, giving it more health and a strong ranged arrow attack. 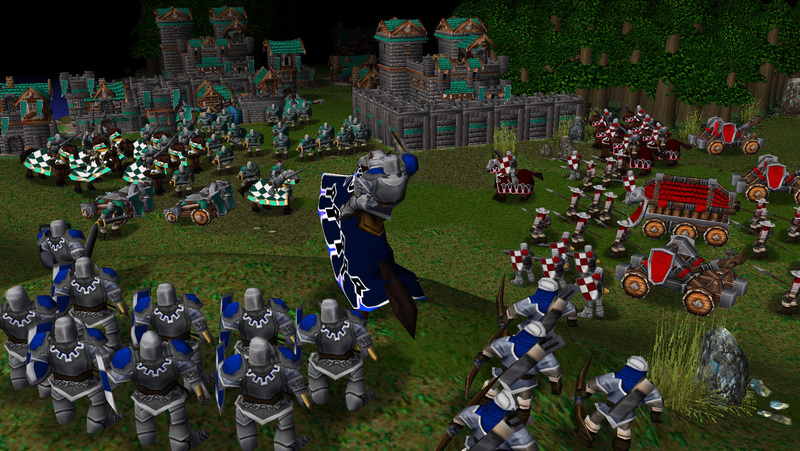 Placing a Garrison on a tactical spot and keeping it until the third age can prove vital for your base defense. Later in the fourth age, you have the option of constructing massive castles but till then, having 2 Ramparts blocking the entrance to your base can be the difference between defeat and victory. 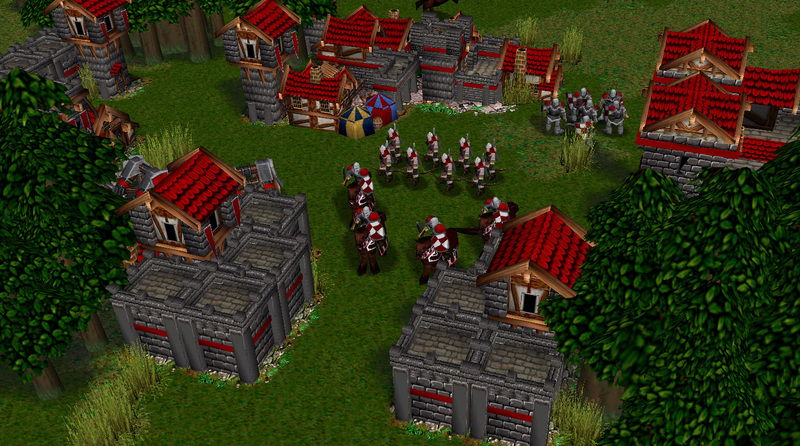 The Age of Empires series offers walls and gates to defend your base, keeping your enemy out but allows you to safely, to some extent, take shelter if need be. I added walls but no gates. 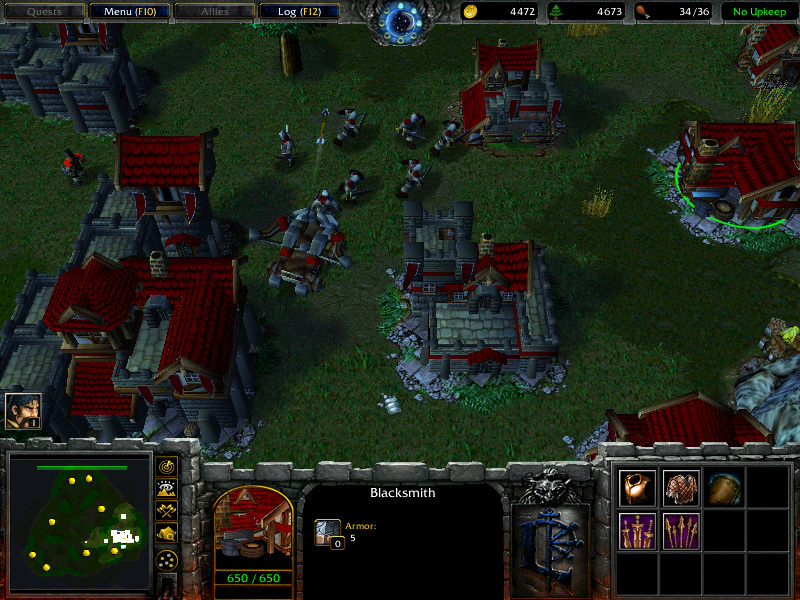 This meant the player could build heavy defenses but like Warcraft 3, they had to have an entrance to their own base which also meant an opening for enemies. 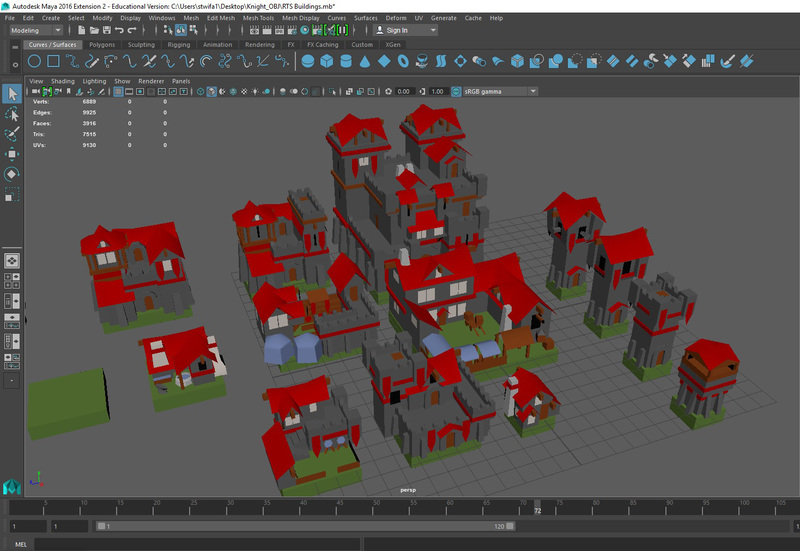 All buildings are made from scratch using Maya. they are then exported as OBJ files, converted into MS3D and finally converted a second time into MDX files compatible with Warcraft 3. 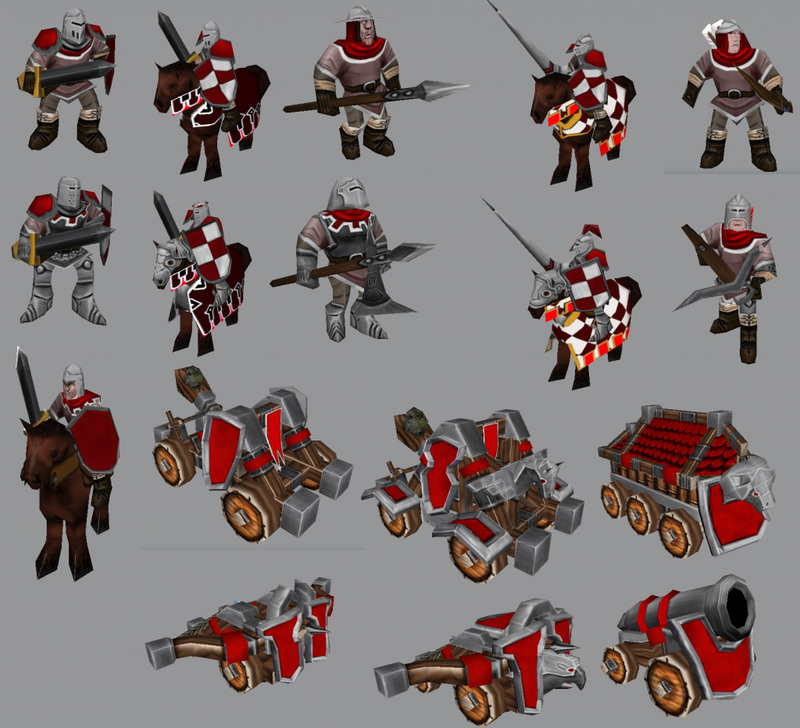 Finished Units with textures made in Photoshop. 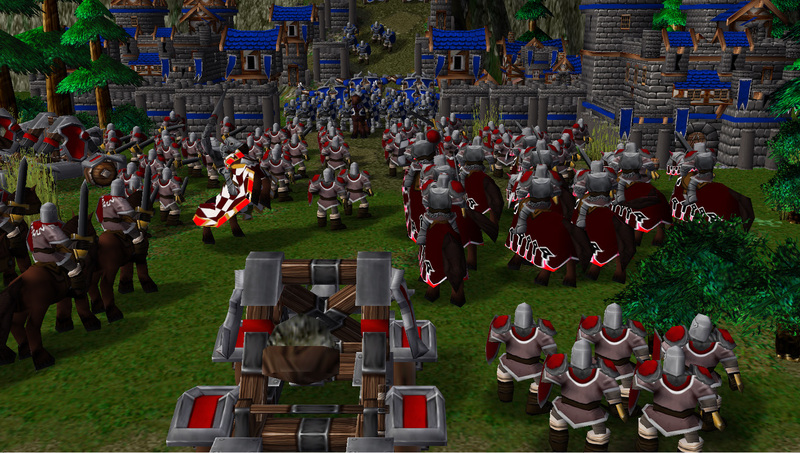 The models had to be quite squared and edgy to work in the old Warcraft 3 Engine. Animations where either transferred from already existing models, World of Warcraft models and then attach the vertex to fitting bones or animated by hand from scratch. The Age of Empires series uses 4 resources. Wood which can be gathered from trees, food gathered from bushes or killing animals and stone and gold mined from veins. If one resource run out, it is possible to use the marketplace and acquire it through a trade where you pay a slightly higher cost each time. 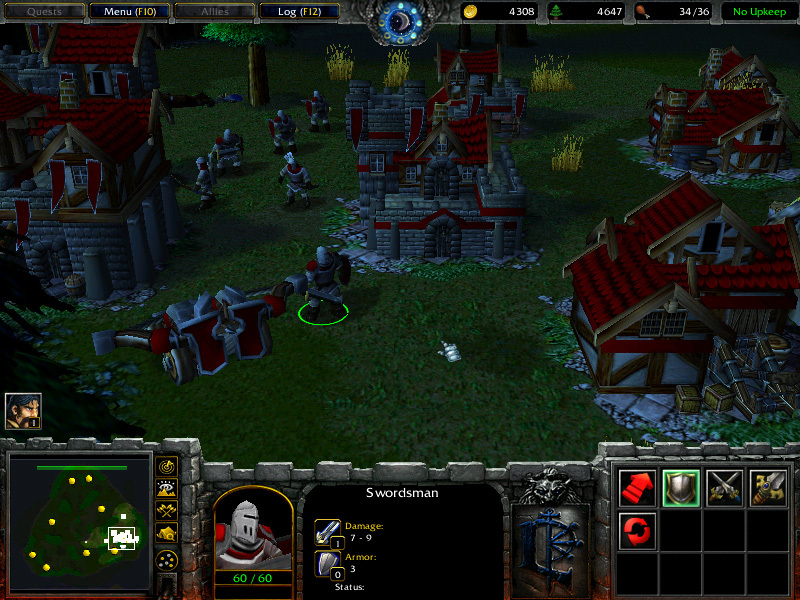 Warcraft 3 only have 2 resources, Gold and Lumber. Lumber is gathered from trees which are abundant. Gold, however, has to be mined from goldmines are placed in symmetric patterns, unlike Age of Empires each Goldmine is a huge point of interest and require defense. Enabling lumber to be traded for gold would reduce the need for goldmines and would drastically remove a large part of the core gameplay where players build bases around the mines and the need to defend them. Another comment was the lack of unit stages, with each age in Age of Empires 2 new unit stages are enabled through upgrades. In the favor mod, only 1 extra stage was added to the units. Age of Empires 2 has 31 civilizations with unique units, buildings, upgrades and play style. They all have something they specialize in, 1-2 unique units, 1-2 unique technologies and civilization bonuses such as gathering gold faster, lower cost for cavalry, extra range to towers etc. Depending on what civilization you choose some unit are restricted to only 2 stages meaning they can only be upgraded once but not further. Making certain upgrades unavailable and adding unique features to civilizations means each civilization has its own tactics and way of playing them. Without civilization/race choice the addition of unit stages it’would be more of a design decision to force players to upgrade their units with stages rather than make tactics changes as radical as they are in Age of Empires 2. It is debatable if it would be worth adding or not but in my opinion, it would not make my mod better or interesting. Balancing the units in Favor to be available in a specific age or after certain upgrades is not only cleaner and easier on the balancing but also removes the need for extra models and units which easily could be replaced with upgrades instead. I am quite pleased with the final result. The mod was well received on Warcraft 3 forums and I was given valuable and honest feedback. The project has improved my view of RTS games and game balancing. For example, balancing and then testing upgrade costs, attack damage and Health on buildings is crucial and setting the cost of a single unit between 100 and 110 can make a huge difference later in the game.